Chinese Premier Li Keqiang will pay an official visit to Australia and New Zealand from March 22-29. During his stay in Australia, Li will attend the fifth annual meeting between Chinese and Australian prime ministers. The five-day official visit is expected to boost the development of China-Australia relations and cooperation, and push forward free trade and regional integration. After his Australian trip, the Chinese premier will pay an official visit to New Zealand. This year marks the 45th anniversary of China's diplomatic ties with New Zealand. China is already New Zealand's biggest investor in agriculture, and the country's top overseas destination of dairy products. And that smooth cooperation is not slowing down, even as world dairy prices drop sharply in the last few months. China's biggest dairy producers keep expanding in the oceanic country. The Premier's visit also comes at the 45th anniversary of the establishment of bilateral relations. Practical cooperation in various fields between China and New Zealand has made remarkable progress, with bilateral trade exceeding 14 billion U.S. dollars last year, up nearly 5 percent year on year. Premier Li was welcomed to New Zealand's Government House by Prime Minister English. The premier arrived in the country Sunday for high-level talks, as both countries push to expand free trade. Ahead of Li Keqiang's visit to New Zealand, CGTN's Wang Tongxuan spoke to New Zealand's ambassador to China John McKinnon. They talked about trade and diplomatic ties between the two countries, which are expected to be high on the agenda during Li's trip. The two nations are working on an upgrade of their 2008 Free Trade Agreement. Chinese Premier Li Keqiang has arrived in Sydney to discuss bilateral ties, free trade, and the South China Sea. In a huge push towards boosting bilateral trade, Chinese Premier Li Keqiang has attended a signing ceremony with Australian Prime Minister Malcolm Turnbull at Parliament House in Canberra, witnessing the signing of eight documents. Both leaders hope to expand free trade and enhance cooperation between the two countries. Signs of Chinese investment in Australia are tough to miss, especially in Queensland where construction of the nearly billion dollar Jewel resort is nearing completion. It’s the kind of foreign investment that is welcomed by the Australian government - and with good reason. China has been the biggest trade partner for Australia for eight consecutive years. Chinese and Australian companies have benefited greatly from their Free Trade Agreement that went into force in 2015. Chinese Premier Li Keqiang (3rd R) and his New Zealand's counterpart Bill English (3rd L) hold talks in Wellington, New Zealand, March 27, 2017. 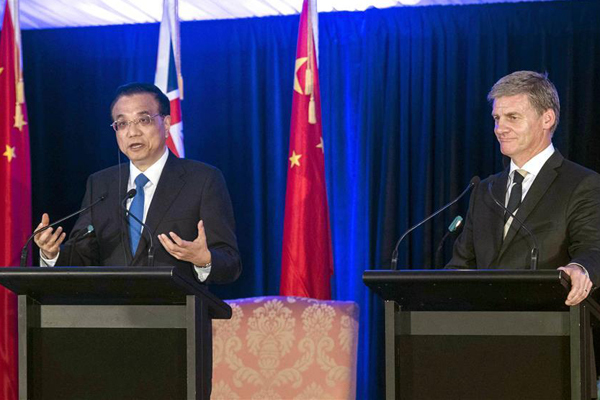 China and New Zealand will jointly establish an upgraded free trade area with more open trade and investment, to promote bilateral trade cooperation and economic globalization, Chinese Premier Li Keqiang said here on Monday. China and New Zealand agreed to start talks on upgrading a bilateral free trade agreement (FTA) in late April. China has witnessed great development of bilateral relations with Australia and New Zealand over the past 45 years since the establishment of diplomatic ties with the two Oceanian countries in 1972. In his article published on March 27, Premier Li Keqiang outlined his ambitions about China-New Zealand relations with his visit. Chinese Premier Li Keqiang arrived here on Sunday for an official visit to New Zealand, the first to the Oceanian country since he took office as Chinese premier in 2013. The importance of New Zealand does not diminish due to its remote location in the Southern Hemisphere, as it well deserves the title "pioneer of China-West cooperation." Visiting Chinese Premier Li Keqiang on Friday attended the China-Australia Cooperation on Economy and Trade Forum with his Australian counterpart Malcolm Turnbull, during which they agreed to promote trade facilitation and liberalization. Chinese Premier Li Keqiang said Friday the market and business community can continue to have strong faith in the peace and stability in the South China Sea and use the sea lanes with free passage to pursue more free trade. The ongoing visit of Chinese Premier Li Keqiang to Australia comes at a time when the two countries celebrate 45 years of diplomatic relations. China will join hands with Australia in promoting globalization, improving global governance and combating protectionism, Chinese Premier Li Keqiang said here on Thursday.